Renal biopsy is a gold standard method for diagnosis of BK polyomavirus nephropathy (PVN); however, it is an invasive procedure, and it can be false negative due to sampling error. 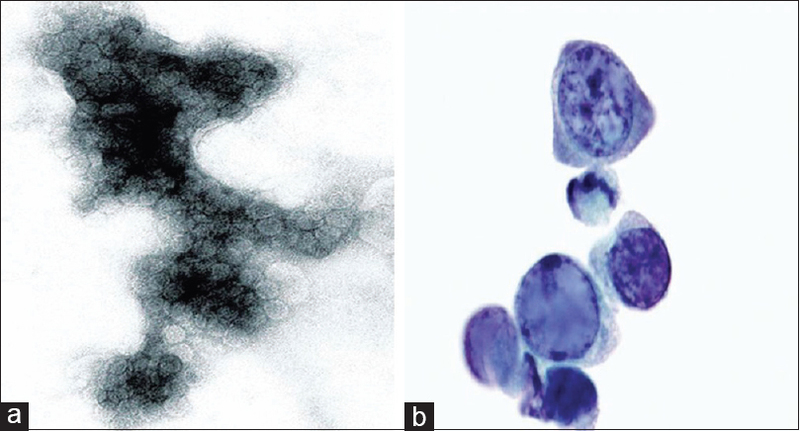 Many noninvasive screening strategies such as decoy cell in urine and viral load assessments using polymerase chain reaction in urine and in plasma have a limited role in diagnose of PVN. Recently, urinary viral Haufen (UVH) is found to be very useful for diagnosis of PVN. The aim of this study was to evaluate the efficacy of UVH in the diagnosis of PVN in all transplant patients. In this systematic review, we included studies where UVH was used for diagnosis of PVN. We searched PubMed, EMBASE, Google Scholar, and Cochrane database of systematic reviews. Two authors independently selected studies and extracted data for review. Five studies were included in this study. One study reported sensitivity, specificity, positive predictive value, and negative predictive values of UVH against kidney biopsy as 100%, 99%, 97%, and 100%, respectively, for diagnosis of PVN in all type of transplant patients. Second study described technique of UVH estimation. Two studies correlated UVH with severity of PVN. Fifth study demonstrated that UVH formation occurs in the setting of high concentration of Tamm–Horsfall protein in urine and also reported UVH as a marker of PVN in mice. Data were not appropriate for meta-analysis. A limited number of studies showed that UVH may be a novel noninvasive biomarker to diagnosis and to predict the severity of PVN in transplant patients. Introduction: Transplant renal artery stenosis (TRAS) is a recognized, potentially curable cause of posttransplant arterial hypertension, allograft dysfunction, and graft loss. Aim: This study aims to study the incidence, clinical presentation, and outcome of TRAS in renal allograft recipients. Materials and Methods: This is a retrospective study done at the Institute of Nephrology, Madras Medical College, from January 2009 to November 2016. Demographic data, type of renal donor, and posttransplant evaluation including delayed graft dysfunction, acute rejection, cytomegalovirus status, blood pressure profile, and graft function were studied. Laboratory and investigation data including serum potassium, lipid profile, Doppler transplant renal artery, and angiogram were analyzed. Results: Five hundred and twenty-six renal allograft recipients were studied; 7 patients had TRAS (1.3%). The timeline of TRAS ranged from 3 to 30 months (median: 5 months) after transplant. Three patients (42%) presented with refractory hypertension, six (85%) patients developed allograft dysfunction, and three (42%) patients presented with anuria. All patients were treated with percutaneous transluminal angioplasty with stenting, and one patient had recurrent TRAS after 1 year and treated with balloon angioplasty and stenting. Among seven patients, three patients have normal graft function, three had chronic graft dysfunction, and one patient had graft loss. Conclusion: The incidence of TRAS in the study was 1.3%. Early detection and correction reduce patients morbidity and allograft dysfunction. Introduction: Lifestyle modification has an important role to play for the success of organ transplantation. In renal transplant recipients, recommended lifestyle measures include proper diet, exercise, clinic visits, monitoring and laboratory investigations as per schedule, protection against infections, and abstinence from addictions. The objective of the present study was to assess the compliance with lifestyle recommendations following kidney transplantation and to identify the potential determinants of noncompliance. Materials and Methods: This was a longitudinal study with 153 adult individuals attending the nephrology posttransplant clinic of one tertiary care government and two private hospitals in Kolkata. Participants were followed up for 1 year at 3-month intervals. A pretested questionnaire was used to screen for noncompliance in seven lifestyle areas, and if noncompliance was identified, its extent was assessed, and individuals probed further to explore potential determinants of noncompliance. 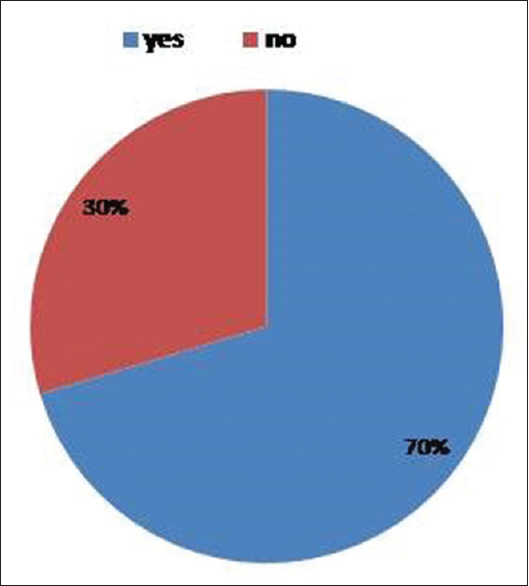 Results: 64.1% of the transplant recipients were compliant with the recommended lifestyle measures overall. Separately, compliance rates were dietary 83.66%, clinic attendance 88.23%, self-monitoring or home monitoring 89.54%, laboratory investigations completion 88.23%, infection prevention 93.46%, and abstinence from addiction 95.42%. No statistical analysis was done for exercise compliance as recommendations were judged inconsistent and inadequate. Logistic regression analysis revealed that number of comorbidities, number of adverse reactions to prescribed drugs, and perceived severity of the disease were significantly associated with noncompliance. Conclusions: Overall compliance with lifestyle recommendations was suboptimum. The noncompliance risk factors identified need to be probed further. 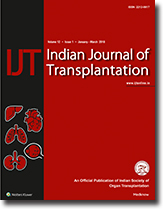 Background: The study was conducted to look for association of health-related quality of life (HRQoL) with renal functions in renal transplant recipients and to examine which clinical measures after renal transplantation are connected to aspects of their HRQoL. Materials and Methods: The study was carried out at IKDRC/ITS, Ahmedabad, between 2013 and 2016. 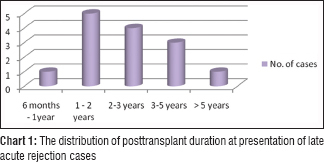 Only patients who completed minimum 3 months posttransplant were included in the study. The responses were summarized and transformed to give eight summary scales which were grouped as physical component summary (PCS) and mental component summary (MCS) to give total HRQoL. Results: Out of 54 patients, 74% were males and 26% patients were females. Age distribution was between 18 and 62 years. Most common cause of end-stage renal disease was chronic glomerulonephritis (42.6%). Forty-seven patients underwent live-related kidney transplant while 7 received kidneys from cadaver. Mental health and MCS scores in males were significantly higher (<0.05) than females. With respect to age, the transplant patients were divided into four groups: younger than 30 years, 30–39 years, 40–49 years, and 50-year-old or older. No difference was found in any scale score between the age groups. The scale scores of PCS in patients with serum creatinine level >2 mg/dL were significantly lower (<0.05) than those of patients with serum creatinine <2 mg/dl. 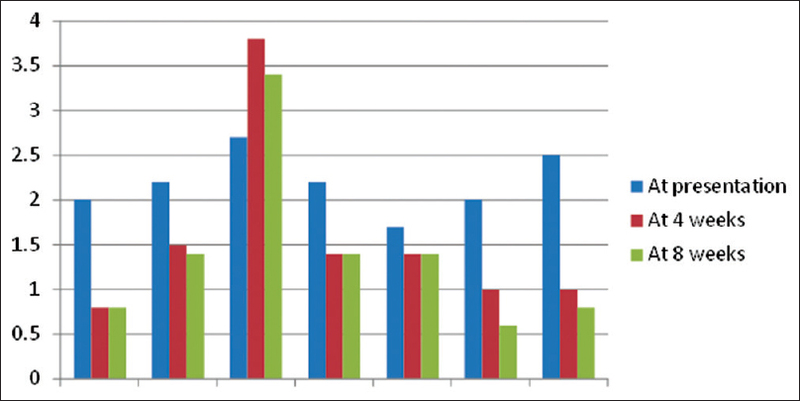 When compared in between patients who had rejection to those who did not, there was no significant difference in MCS and PCS. The scores of patients with cadaveric transplantation were similar to those who received a living-related transplantation. Longer time since the transplant operation was significantly associated with lower scores of the vitality scale. Conclusion: SF-36 V2 is a good tool to monitor HRQoL in renal transplant recipients. Episodes of hospitalization and rejection did not affect the present HRQoL in our study. Background: The histological spectrum of explant liver pathology and their prevalence has not previously been reported from the Indian subcontinent. (1) The study was performed to provide new insight into the prevalence of explant liver pathologies in this part of the world by retrospective analysis of the spectrum of histological changes, (2) to study the etiopathological association of cirrhosis, (3) to study the etiopathogenesis for development of hepatocellular carcinoma (HCC), and to analyze whether there is any association of macroregenerative and dysplastic nodule with HCC. Materials and Methods: Written records of all explant liver pathology service were entered into an electronic database. 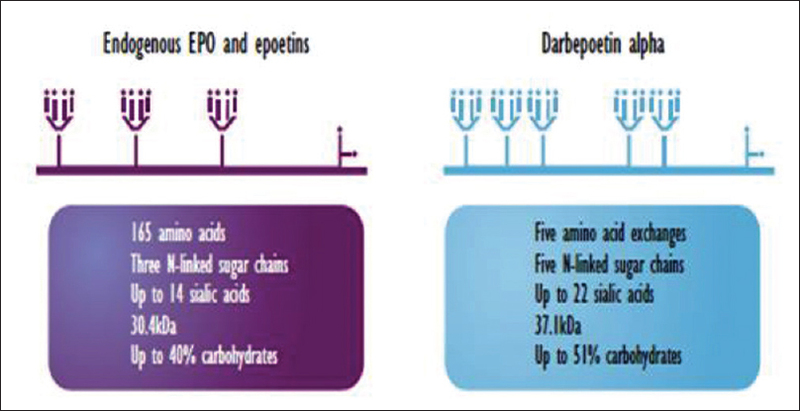 Retrospective analysis of the liver explants was performed from May 2015 to July 2016 at a tertiary-care center in India. Results: Maximum (97.2%) number of liver explants showed cirrhosis. Hepatitis C virus (HCV)-related chronic liver disease was the most common etiological factor for the development of cirrhosis in this part of the world followed by HBV and alcohol. The association between HCC and HBV was found to be statistically significant with a value of P = 0.009. The association between dysplastic nodules and HCC was also found to be significant. 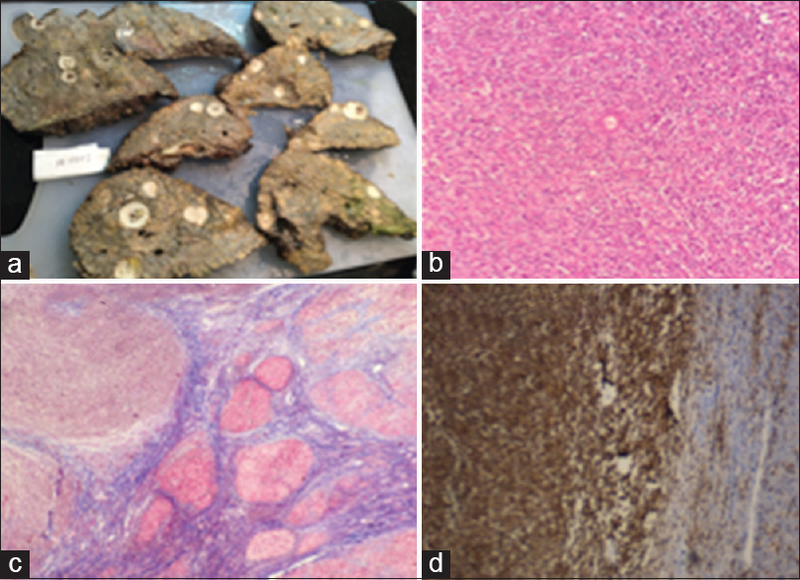 Conclusion: This is the first study to describe the histological spectrum of explant liver pathology from India. HCV forms the major disease burden for the chronic liver disease. There is a significant association of dysplastic nodules with HCC postulating their role as a precursor lesion in HCC. Introduction: Late acute rejection (LAR) is different from early acute rejection with respect to risk factors, management, and prognosis. The long-term graft survival has been shown to be adverse after LAR. Materials and Methods: This was a prospective study including 15 biopsies reported as LAR in 12 patients. The clinical details, transplant duration, risk factors, biopsy findings, antirejection treatment, and outcome are studied. Results: The risk factors for developing LAR in our study included delayed graft function, associated infections, and noncompliance. Majority were combined cellular and antibody mediated. Antibody-mediated rejection (ABMR) component was identified in 13 biopsies. Plasma cell-rich form was seen in four biopsies. Most of the patients had persistent graft dysfunction with five of them going into graft loss. Conclusion: It is important to identify LAR, especially late ABMRs. They are different from chronic rejections. The graft outcome was found to be poor. Purpose: Kidney injury molecule (KIM)-1, a transmembrane-tubular protein, is excreted in the urine within 12 h of the initial ischemic insult and before regeneration of the epithelium. 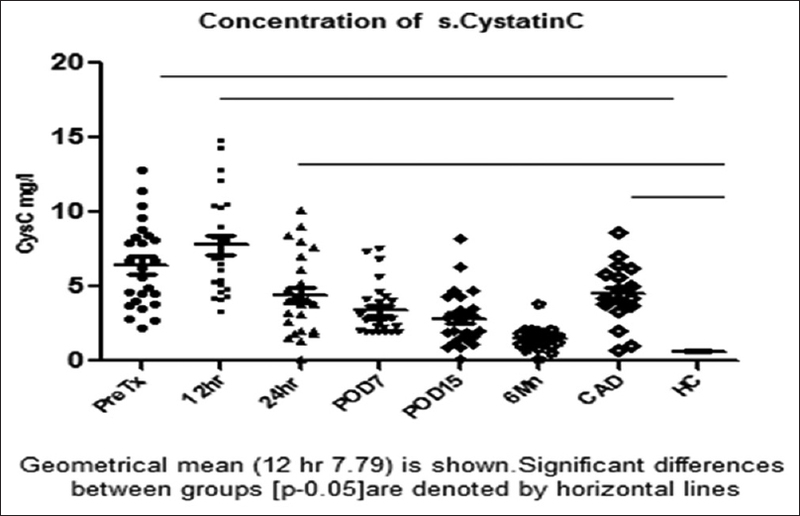 Cystatin C (CysC) a low-molecular-weight nonglycosylated protein has been shown to be a good marker of kidney function. We aimed to evaluate the levels of KIM-1 and CysC immediately after transplantation as an early marker. Subjects and Methods: Urine and blood samples were collected from prospective renal transplant patients with chronic allograft dysfunction (CAD) at baseline and during the follow-up period at the interval of 12, 24 h, 7th postoperative day 15th and 6 m, and compared with healthy controls (HC) for KIM-1 CysC S.creatinine (SCr) and creatinine clearance. Results: Kidney transplant recipients showed significantly higher KIM-1and CysC values than the control group. Nonparametric receiver-operating characteristic (ROC) curve of the renal function with an area under the curve of 0.518 KIM-1, CysC was 0.841 and creatinine 0.74 indicating CysC at 12 h posttransplant (post-Tx) is a better biomarker among three. ROC of acute rejection (AR) of KIM-1 at 24 h post-Tx showed sensitivity of 0.938. ROC for distinguishing between graft survival and failure at 1 year showed a sensitivity of 0.763 for CysC, In CAD, both KIM-1and CysC were increased as compared to HC. Conclusion: Both KIM-1 and CysC are useful markers for predicting AR, renal function. Elevated urinary levels of KIM-1 independently predict AR. CysC is a valuable marker of predicting the long-term outcome. Emphysematous pyelonephritis (EPN) is a rare gas forming, necrotizing infection of the renal parenchyma. It is potentially lethal, if not recognized and treated promptly. EPN-affecting renal allografts has been reported infrequently. 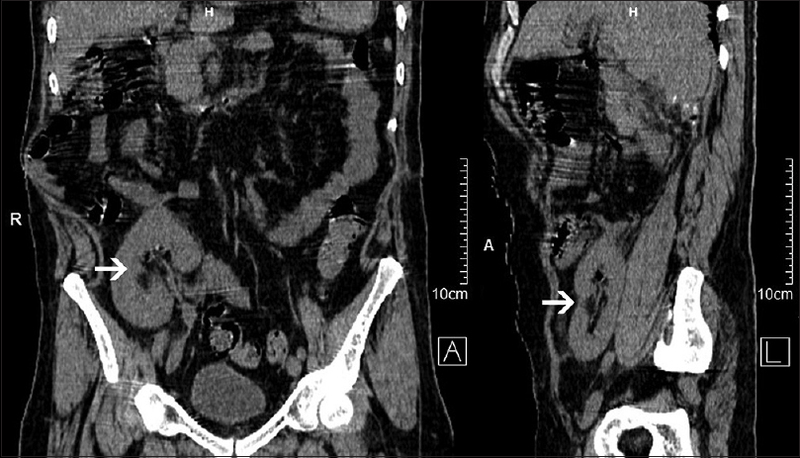 We report a case of 34-year-old male renal allograft recipient presented with urosepsis and acute graft dysfunction, found to have EPN. He was treated conservatively with antibiotics and ureteral stenting along with reduction of immunosuppression, with complete recovery. A 20-year-old male with hypothyroidism, chronic kidney disease Stage V due to hypertension, and Henoch–Schonlein purpura (IgA vasculitis) underwent a live-related renal transplant in 2015 with mother as a donor. He was inducted with single dose thymoglobulin 75 mg following which he was initiated on triple immunosuppressive therapy – prednisolone 25 mg once a day, tacrolimus 2.5 mg in the morning and 3 mg in the night, and mycophenolate mofetil 750 mg BID. On the 5th day of transplantation, he noticed purpuric rashes in the forearm and thigh associated with hematuria. He had good graft function. Renal allograft biopsy on sixth post operative day showed recurrence of IgA nephropathy (IgAN). With recent advances in the treatment of human immunodeficiency virus (HIV), renal transplantation is no longer considered a contraindication in properly selected HIV-positive patients. However, while doing transplant in an HIV-positive patient, one needs to keep in mind the interaction between HIV drugs and immunosuppressive drugs. Further, doing an ABO-incompatible (ABOi) transplant could be a challenge due to higher immunosuppression that can result from the desensitization, exacerbating HIV-related immune dysfunction. We report a case of successful living-related donor ABOi kidney transplant in an HIV-positive patient.